Micro USB, connected to a 5 volt 2 amp power source. 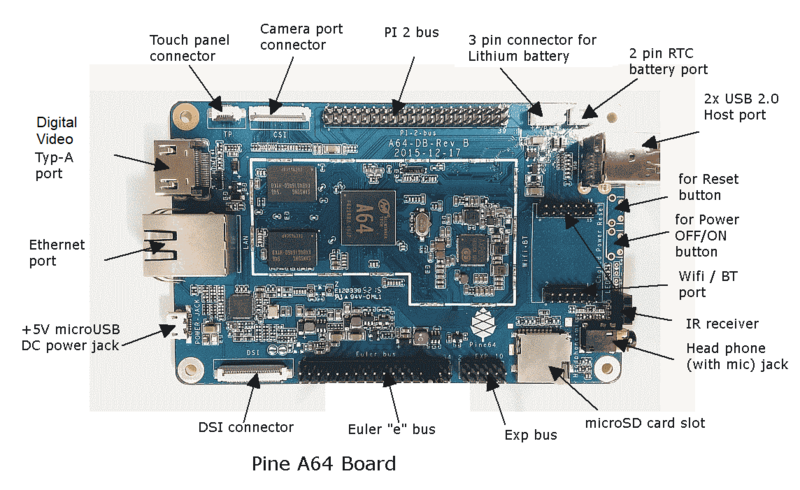 If you take a look at the wiki.pine64.org page you'll find info about this. As you can see the power connector is a microUSB. yes thats the cable you need, but you allso need a wall-plug that supply at least 2A. Note that you also need a USB charger, preferably at 2A. Would you look at this one for me, there are restrictions on the first one I found that I can't buy several for my coming Pine cluster. (02-26-2016, 03:49 PM)Ron Piggott Wrote: [ -> ] Would you look at this one for me, there are restrictions on the first one I found that I can't buy several for my coming Pine cluster. The item can be found here... (be aware of the (most likely) slow shipping. Most items from AliExpress is taking forever to arrive... At least to Norway where I live). Any microUSB cable should be fine, including that one. Since you are planning to use on a cluster, you may select a long cable that is flexible. from Aliexpress. Select a seller that has good reputation and there is lots of positive feedback. Aliexpress is good because sellers are fighting to build reputation. If a cable has a defect, you can ask for a new one to be sent. Am I missing something? Are micro usb cables super-rare in Canada? Having said that, I'm a fan of Aliexpress too. As long as you choose reputable sellers by studying their feedback (as taros mentions), you can't beat shopping for stuff there in terms of price. But a micro usb you can pick up pretty much anywhere for cheap. Yes, you can pay more for some, you can get cables with extra shielding, or braided or flat or whatever - that's gonna cost you more...but largely speaking, there shouldn't be any trouble walking into your local discount store and picking up a cheap micro usb cable.